Weddings and special events require a lot of planning and preparation. There are lists to make, scheduling to work out, configuring to do, and people to wrangle. If you don’t have a professional event planner who routinely follows a checklist of necessities, it’s easy to overlook some essentials that didn’t cross your mind. One in particular people often overlook is the personal needs of their guests, particularly at weddings where the focus is mostly on the wedding party. Something as important as toilet provisions is not something you want to be scrambling to get to your event at the last second, but these are often forgotten when weddings or events are held at unique destinations or outdoor events. That’s why Forever Clean makes it easy to handle this need, even when you’re in a pinch. We offer a line of varied portable toilet rental options suitable for an array of events. Our rental rates are affordable, our service is prompt and professional, and our inventory provides something for any type or number of guests. All of our restroom options are modern, very well cleaned and sanitized, well stocked, and ready for use at a moment’s notice. We want your day or night to be a memorable one for all the right reasons, so let the Forever Clean team make it easy with a range of portable toilet options you probably never imagined existed. You may be surprised to find out that rentable toilet actually come in a variety options that greatly differ from the stereotypical type you’re used to seeing. Some are compact, some are spacious, some are plain, some are decorated, and some even come with features you didn’t know you can get. At Forever Clean, we offer them all depending on your need. See our selection below to determine what might be best for you and your guests. We didn’t forget about guests with special needs. Our handicapped-accessible portable toilet option is fully ADA compliant, roomy, and has a flat floor for easy maneuvering. It also features interior handrails and excellent ventilation. For added sanitation, we also offer a portable hand washing station that has two separate hand washing sinks. These units feature a foot-operated water pump and are perfect for festivals, outdoor events, weddings, and more. How Many Portable Toilets Will You Need? 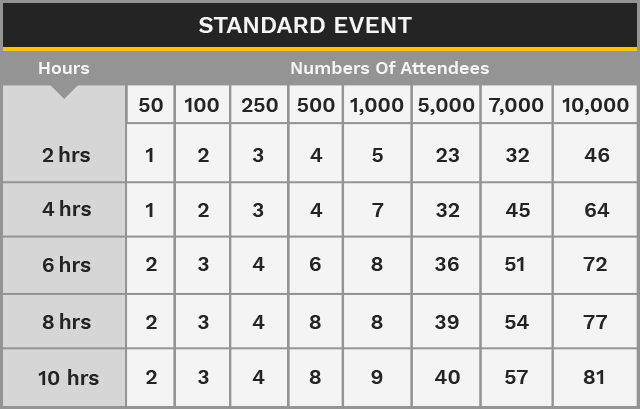 Forever Clean has made it easy to determine how many units will be appropriate for your event. 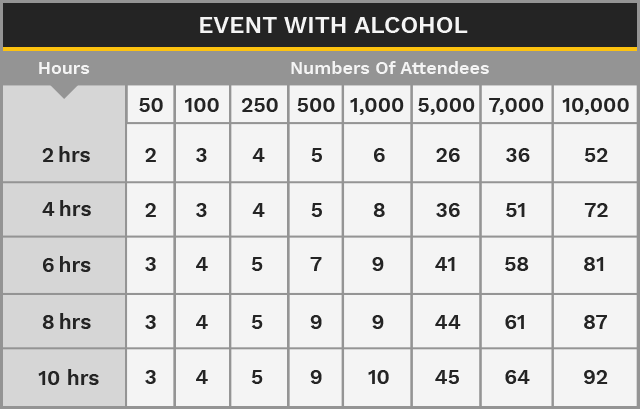 A number of factors go into this decision, including that length of the event, number of attendees, and presence of alcohol. The charts below provide a rough estimate, but a quick call to us can get you an expert recommendation.